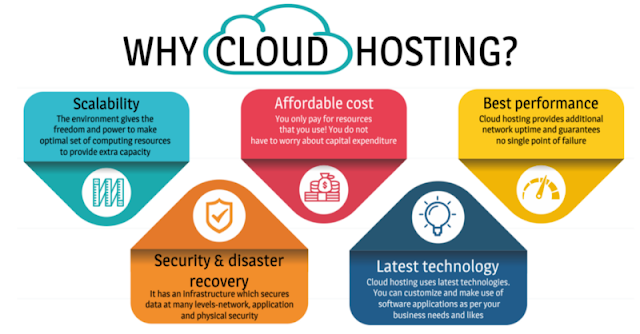 Just like other various hosting platforms, Cloud hosting has its own benefits and intrinsic features. It has been currently spread widely and almost all businesses are switching from other hosting platforms to cloud. However, there are several more reasons why you should shift from traditional hosting to cloud hosting, and before you shift, you need to be aware of the inherent characteristics and what exactly cloud hosting is. Let us get into brief about what cloud hosting is, how different it is from traditional hosting and the advantages it offers. Cloud hosting sites operate across many web servers that are interconnected. The data is provided from various servers. Whenever you perform a search on Google, instead of running the query on a single network, it runs on an enormous network of computers (cloud). Google does not have to worry about the load. It gives pliability of adding more servers to the network in order to handle the load. One can add other servers the in-network easily to tackle downtime. The key benefit of cloud hosting is the ease of scalability. The environment gives the freedom and power to make an optimal set of computing resources to provide extra capacity. It instantly allocates resources with needs of the website and adds or reduces resources like bandwidth, storage, RAM, etc. Whereas in traditional hosting you have limited resources and firm specifications so you cannot add resources immediately. You only pay for resources that you use! You do not have to worry about capital expenditure because you do not need to buy any infrastructure, house or maintain your own hardware and there is no wasted capacity remaining unused. Compared to traditional hosting, you have to pay a fixed amount for the services whether you use them or not. Cloud hosting means speed and great performance! It allows load balancing across multiple servers because it allows increased capacity leading to increased availability. Since cloud hosting provides additional network uptime and guarantees no single point of failure, it performs far better than traditional hosting servers do. Additionally, server uptime is equivalent to performance. Due to low-density servers, premium hardware, and multiple caching layers, it allows 2x faster load times. One of the biggest concern related to hosting is security. If you are using multi-server application like Cloud, it makes security and disaster recovery much easier. In traditional hosting, you usually share resources, RAM, CPU needs, etc. with other websites on the same server, or you have to buy a dedicated server to secure information which costs too high. Other people cannot access or disrupt your data since Cloud hosting has an infrastructure with secures data at many levels-network, application, and physical security. It ensures that data is safe through encrypted solutions, firewalls, etc. Cloud hosting being a multi-server setup provides disaster recovery feature as data is backed up in the inter-connected server automatically. On traditional hosting, you only have one server where you can host your data, therefore, they do not offer disaster or backup recovery. You have to arrange it yourself. Cloud hosting uses latest technologies. You can customize and make use of software applications as per your business needs and likes. These latest technologies and upgrades have made cloud hosting very popular. Latest versions of software and computer processing power are also included. Whereas, in traditional hosting, you cannot customize according to your needs and preferences. Sites hosted in cloud environment perform anytime better than hosted on the traditional server. It is a great model where storage and computer solutions can be used by businesses. For businesses that require high loading page speed, immediate allocation of resources, environmental friendly server, disaster and backup recovery plans, etc. then cloud hosting the perfect option for you.